Posted 10 April 2014 & filed under 1950s, Churches, Places and spaces. The Cottonmill Baptist church, Abbots Avenue, was a sister church to the Baptist church in Dagnall Street, St Albans. Money was raised by the community to build this church in the early 1950s. 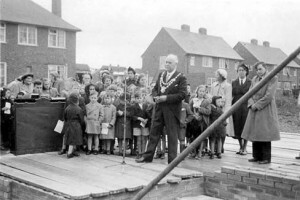 The photo on the left is of the ceremony of laying the foundation stone by Alderman Bird, the Mayor in 1952-3. It is thought that the man on the right is Mr Macmillan, who had a lot to do with the church, and the lady in the uniform was known as Sister Ruth. Mr Sinfield is playing the piano. In 1968, the Cottonmill Baptists merged with the Park Street Baptists and the church was left vacant until 1976 when it was bought by the Christadelphian church. The names are wrong accompanying the photo. The chap on the right is Norman McCleod, not Macmillan. Norrie McCloud, Uncle Mac to the kids, and Sister Ruth ran the Sunday School in the early days along with a lady called Shirley Messenger. then and remember too sitting with Lottie McCleod his wife. I think they had a daughter.